The Grand National is a hugely popular race for not only big punters but the pound each way brigade. In truth, this makes this race very much a family affair. How many people do you know who have a bet on this race? One pointer which our Cheltenham guest blogger [Sean Kelsey] passed on is that it pays to take ante post prices as bookmakers are keen to shorten the odds just before the off - SP backers can find themselves short changed. From a betting perspective it is interesting to take a look at this year's fancies & review the bet history, as far as the markets are concerned, of the major players. It's a great way to appreciate how the markets fluctuate and give evidence that there are opportunities for value hunters. On His Own trained by Willie Mullins owned by Andrea & Graham Wylie. Presently, this nine-year-old bay gelding is favourite at 7/1. However, he has been well backed. 10/1 was available with most bookmakers in February. Bet Victor laid good money at 25/1 in November of last year. While the biggest price were laid in April (2012) when Bet 365 offered 50/1. What a great bet that would be now. Seabass has been a popular horse in the betting since finishing a creditable third in last year's contest. This Irish raider is a 10/1 shot with most bookmakers. Early February 16/1 was freely available. Mid 2012 most firms offered 20/1. Bet 365 went 25/1 after last year's place performance. Cappa Bleu finished fourth in the 2012 Grand National and the market moves have been positive for Evan William's eleven-year-old, an Irish bred son of Pistolet Bleu. He has been steady in the betting for the last month around 12/1 - 16/1 mark. However, there was a substantial market move in mid February when 25/1 was snapped up. A few bookmakers offered 33/1 straight after last year's National. Colbert Station is 12/1 at present backed from 16/1 over the last few weeks. There must have been some uncertainty about this J P McManus horse at the end of January as Stan James dangle the carrot on a stick with 33/1. Chicago Grey 14/1 was available mid January with Bet Victor at 50/1. Imperial Commander best priced at moment 20/1 with Ladbrokes but generally 16/1. 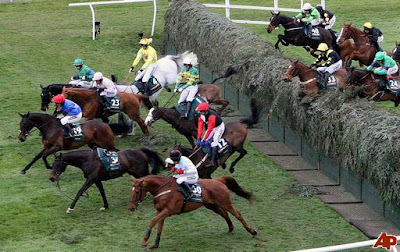 Mid March this horse was 33/1. At points Stan James have offered 40/1 & 50/1 respectively. Rare Bob 25/1 with most bookmakers. Bet Victor had this eleven year old priced at 80/1 in late February. Tofino Bay now a 33/1 poke but Sporting Bet had this gelding at 125/1 in mid February.